Capitol Piazza seems like a new favourite for foodies, comprising of hot restaurants including Dazzling Cafe from Taiwan and Angelina from France. 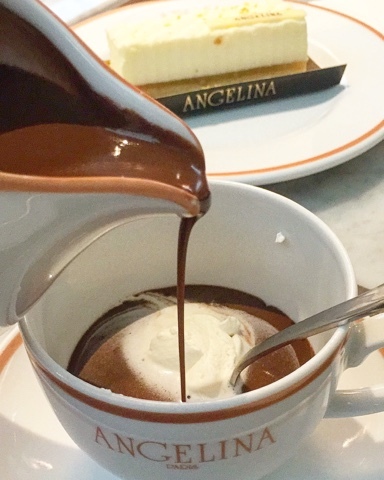 In this post, I will be sharing my gastronomic experience at Angelina!!! They have breakfast menu which last till 11.30am (it opens at 10am). A brunch menu which last tills 2.30pm. And the others available from 11.30am onwards. The brunch menu is part served on a mini tiered-tray similar to a tea-time set. Pretty cute I feel. First up, the old- fashioned hot chocolate "L'Africain" is seriously, last warning. The rich and smooth hot chocolate is served in a mini pitcher and a small, elegant cup. This is almost like a dessert on its own, better than a chocolate cake or ice cream. But definitely not for the faint-hearted given the richness in every drop of hot chocolate. There is whipped cream for you to mix in which thickens the drink and makes it creamier. It is up to you to apportion the chocolate and the whip to your liking. I prefer a tiny dollop of the cream stirred thoroughly into my hot chocolate. This is recommended to be shared especially if you're having desserts along with this. 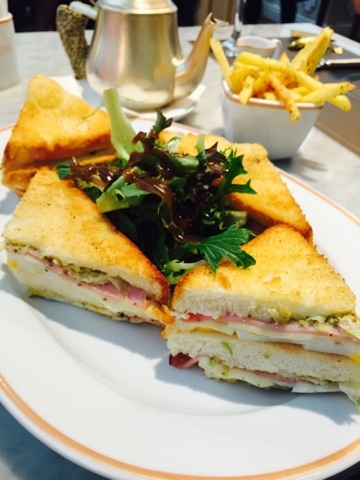 Knowing we cannot cope with all sweets, we ordered a safe snack - club sandwich otherwise known at Angelina as the Parisian Sandwich. It is served with a bowl of French fries and mesclun salad. We had the choice of smoked salmon, ham and cheese, chicken or vegetarian for the sandwich. Ham and cheese sandwich was what we got (see below). The toasts are deep fried to give it the crispy touch. There is lettuce salad and hard boiled egg layered in between the toasts. I found this pretty well done since it's worth S$22. The fries turned soggy pretty fast and I reckon it could be better. Otherwise, I still love my sandwich at Angelina. We also ordered a pot of jasmine green tea but it is not re-fillable unlike most places. It is a good choice to go with the dessert- Lemon Cheesecake. 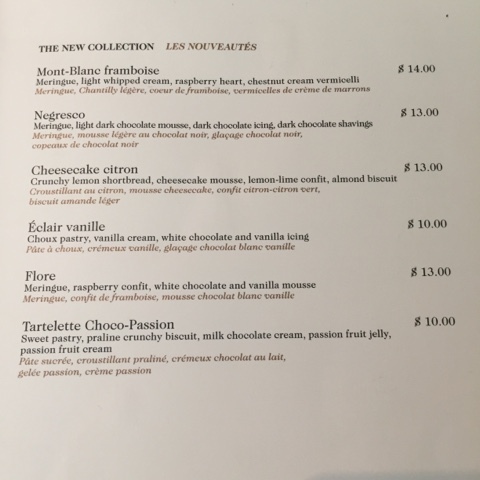 I attached their dessert menu at the bottom of this post knowing some of you might be keen. Zesty and citrusy mousse with crunchy biscuit base are the reasons why I would give this cake an A. 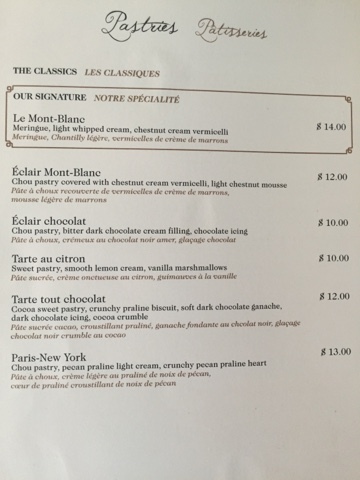 Most of the desserts here look promising from the looks of the description and the crowd seated in the restaurant on a Saturday afternoon. Expect to spend up to $50 per pax if you are here for meal and desserts. Ours was $70 for a main course, 1 dessert and 3 drinks. Ambience is classy but rather noisy given the open setting on level 1 of Capitol Theatre. Also, it is surrounded by several other restaurants such as 1933 and Equilibrium. 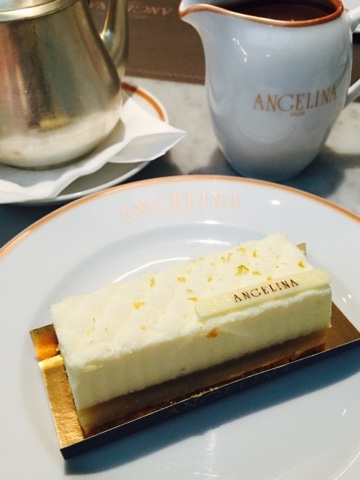 Angelina is situated near the door to Capitol Galleria. I'd be back for more for a chilling good time.